How do I Generate a CSR (Certificate Signing Request)? You may be asked to generate a Certificate Signing Request, or CSR, if you are purchasing an SSL certificate through a third party certifying authority. Once generated, you will need to submit that CSR to your third party provider, who will then create an SSL certificate for you. Already have an SSL certificate? You may be able to skip generating a CSR and simply import your certificate and private key. See Installing an SSL Certificate for details. Please note only Media Temple SSL and GoDaddy SSL certificates are valid for the Managed Wordpress Hosting. Other third-party SSLs are not able to be installed to this server type. The following guide only applies to generating a CSR for GoDaddy. Media Temple SSLs already come with a CSR generated for you. If you wish for assistance in generating a CSR, feel free to contact Support directly by opening a support request, starting a chat, or by calling us at 1.310.841.5500 and we'll be happy to assist you. 1. Connect to your site via SSH. Common Name: The domain name or URL you wish to secure. 3. A Private Key (.key) and CSR (.csr) will be generated in the directory you ran the previous command from. 1. Sign into the Account Center. 2. In the Overview page, click on the blue Admin button for your Grid server. 3. After clicking the Admin button, you will be taken to the Server Overview screen. Look towards the left site to find Sites and select your desired domain. 4. 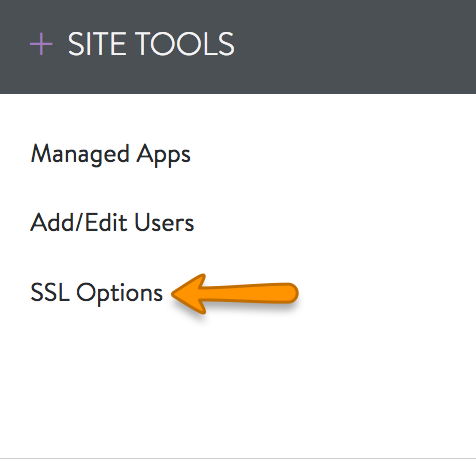 After clicking on the Sites button, look for the Site Tools box and select SSL Options. Note: If you are ordering a certificate from (mt) Media Temple, a CSR is automatically generated for you during the ordering process, and you can proceed with the Grid automatic SSL certificate installation. 5. Click on the Generate CSR button, fill out the required fields with details about your organization and domain, then click the click the Generate button when you are finished. 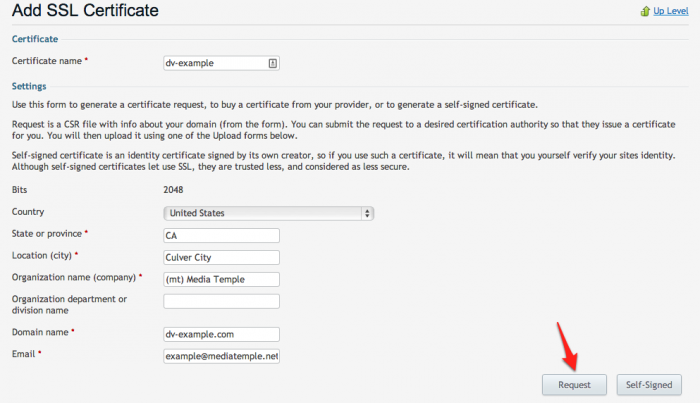 Wildcard SSL: Media Temple services support Wildcard SSLs. Wildcard certificates secure the common name (example.com) and all subdomains at the level you specify when you submit your request. In order to generate a CSR for a wildcard SSL, just add an asterisk (*) in the subdomain area to the left of the common name (*.example.com). 6. The page will reload when your CSR is finished generating. Submit it to the Certificate Authority (CA) and they will sign a certificate for you. Make sure to copy the text that starts with the line -----BEGIN CERTIFICATE REQUEST----- and ends with the line -----END CERTIFICATE REQUEST----- to capture the entire CSR. 7. Once you receive the certificate from your signing authority, follow this guide to install your SSL certificate. 2. In the Overview page, click on the name of the specific domain or subdomain that you wish to generate the CSR for. 3. Select the SSL Certificate icon. 4. Click on the Generate CSR button. If you are using the Service Provider view, navigate to the Control Panel or Open in Power User View option for the domain you are looking to secure. If you are already using Power User mode, proceed to the next step. Click on the Websites & Domains tab. You may need to select the downward-facing arrow to expand the available menu options for your site. From the expanded menu, select Secure Your Sites. Select Add New Certificate. You will be taken to the Certificate Request Page. Fill out the Certificate Request form with all relevant data for your website, then click Request to continue. An entry for your SSL certificate will be created in Plesk and a CSR generated. You will see this new entry on the SSL Certificates page. Click on the certificate name to continue. You will be taken to the Change Properties page. To view the CSR, scroll down to the CSR and Private Key sections. 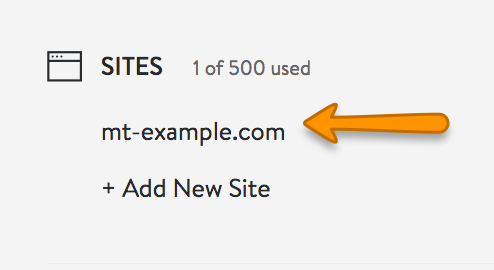 From the row of tabs at the top, select Websites & Domains. Click on Secure Your Sites. Log into the Plesk Server Administrator Panel. 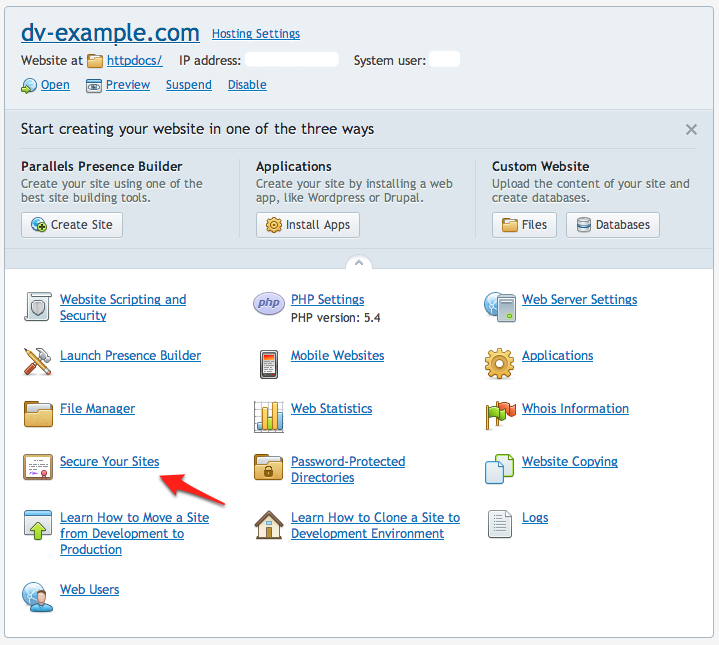 From the left-menu, click on Domains from the Hosting Services section. 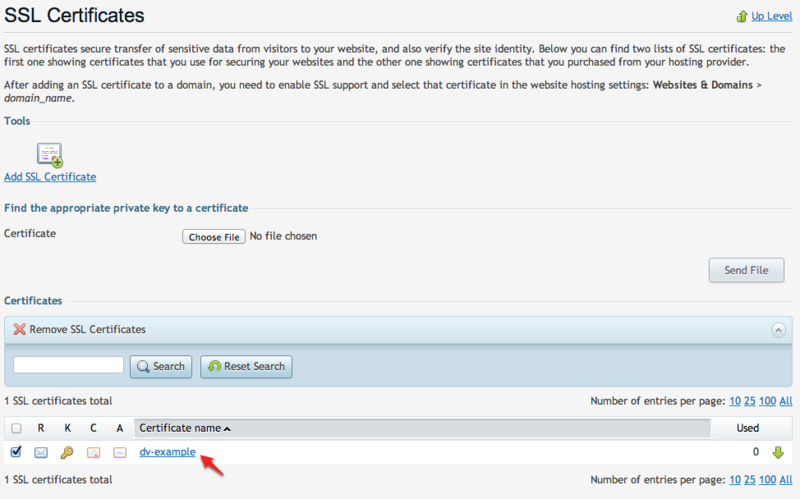 Click on Manage Hosting or Open in Control Panel for the domain you are installing the SSL certificate. From the row of tabs at the top, select Websites and Domains..
From the row of tabs at the top, select the Server tab. Under Tools & Resources, click on SSL Certificates. From the left-menu, click on Tools & Settings. Once you are at the SSL Certificates screen, continue with generating the Certificate Signing Request by following the instructions below. Click on the Add SSL Certificate icon. Certificate name. This will help you identify this certificate in the repository. Your location and organization name. The values you enter should not exceed the length of 64 symbols. Domain name. The domain name for which you want to purchase an SSL certificate. This should be a fully qualified domain name. For this example, we use: dv-example.com. Email. The website administrator's e-mail address. Double-check to ensure that all the provided information is correct and accurate, as it will be used to generate your private key. Click the Request button. 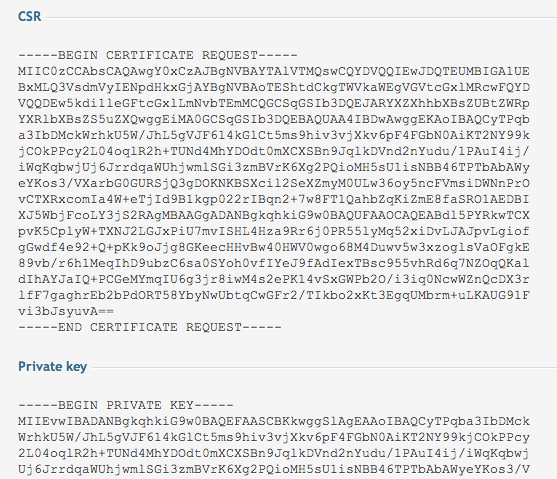 Your private key and certificate signing request will be generated and stored in the repository. 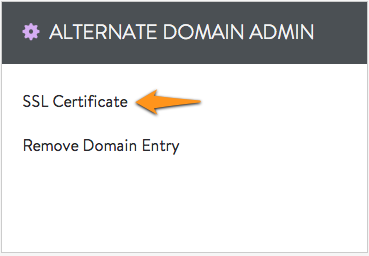 In the list of certificates, click the name of the certificate you just created. A page showing the certificate properties opens. Locate the CSR section on the page, and copy the text that starts with the line -----BEGIN CERTIFICATE REQUEST----- and ends with the line -----END CERTIFICATE REQUEST----- to the clipboard. Submit your CSR to your third-party certifying authority. Fill out any information they require. When you fill in the server type, select Apache or Apache OpenSSL, whichever is available. It may take a few days for the certifying authority to process your request. If you have questions about the status of your request, please contact your third-party vendor. How can I host multiple sites on a single IP address?